Purim everywhere is fun, but Purim in Israel is especially fun. As you probably know, Purim commemorates the defeat of Haman in ancient Persia. Under King Achashverosh in 485-465 BCE, Haman, the king’s advisor, sought to have all the Jews in the Persian Empire killed. Deliverance came through the hand of Esther the Queen, who unbeknownst to everyone, was Jewish. To celebrate, Jews listen to the Megillah reading at night and in the morning, send baskets of food to friends, give charity, dress in costumes, eat a hearty meal and drink alcoholic beverages. 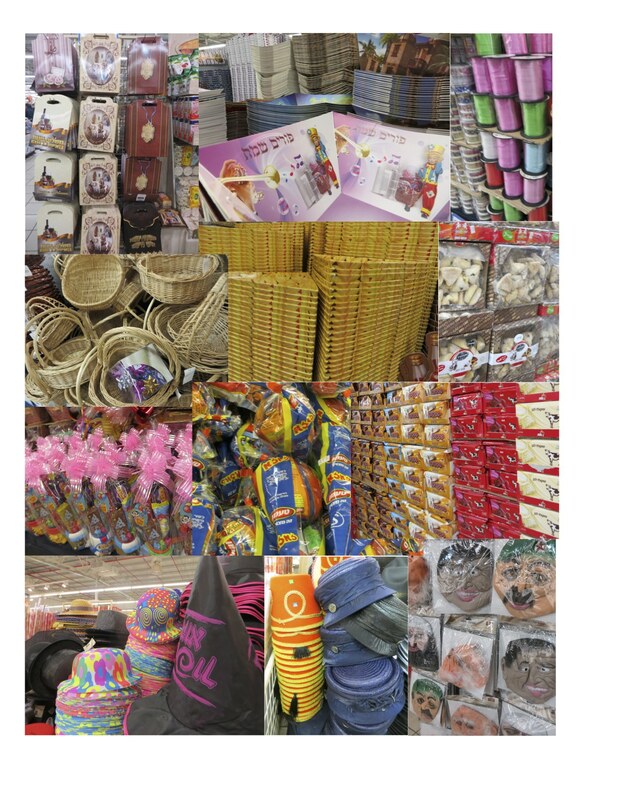 There’s no need to run around to special Purim shops, as the major supermarkets and many small stores as well, start selling Purim supplies about two weeks earlier. Items include boxes of chocolates, wines, hats, baskets, hamentaschen, paper boxes, ribbons, masks, candy and of course already filled Purim baskets. Best of all, you can celebrate Purim for two days. All cities besides Jerusalem celebrate Purim on the 14th day of Adar on the Jewish calendar. The Megillah says that Shushan, which is a walled city, celebrated Purim for two days. To remember that, all walled cities in Israel, celebrate Purim on the 15th of Adar, one day later. Since Jerusalem is the only walled city in Israel, only Jerusalem celebrates Purim on the 15th of Adar. So you can celebrate Purim outside of Jerusalem on one day and go into Jerusalem the next day for more Purim celebrations. 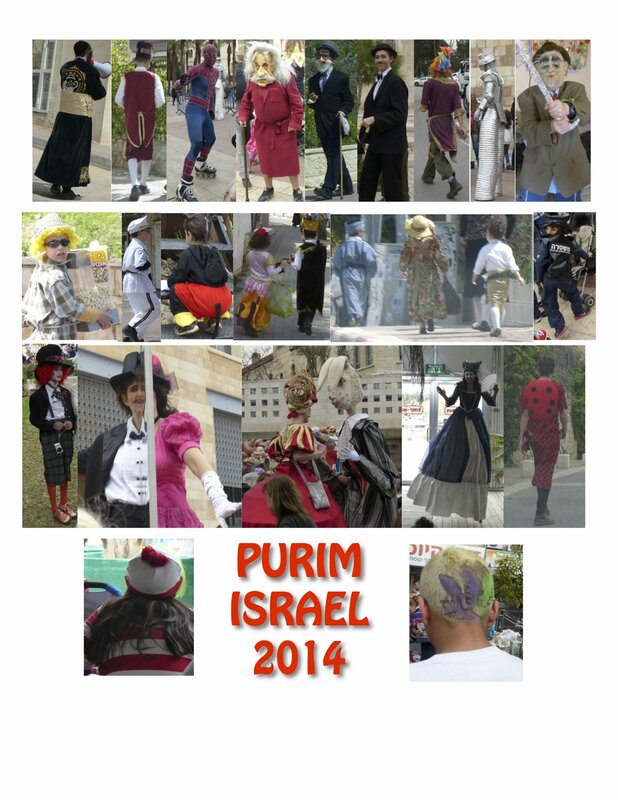 The biggest Purim parade in the country is in Holon, but there’s one in Tel Aviv and possibly other cities. A carnival atmosphere pervades the country and many public and private parties are held. A good time is had by all. Here are a few photos from the festivities in Jerusalem and Bet Shemesh. Now as you know, when Purim is over, PASSOVER is not far behind. This year Passover begins on the evening of April 14, so it’s only three weeks away. For Passover t shirts for kids and adults and for hostess gifts, click here. Now that Purim is over, you know what’s ahead. Passover, Pesach. Cleaning, cooking, and hopefully enjoying. To help with Passover, the next few blogs will be based on this joyous Jewish Holiday. Today’s blog will include suggestions for t shirts and baby gifts for infants for Passover. These baby items are just a few of the designs, colors and products we feature for kids for Passover. To See the entire collection of our kids wear, click here. Shop with confidence as all JewTee.com products feature a 30 day money back guarantee.